Your trip in Baler is not complete without exploring the picturesque eco-tourism and historical sites around. While Baler is not as bustling as Boracay, it sure has a captivating charm of its own. Baler is a part of the province of Aurora, and the spectacular sites go beyond this town, extending to the quaint towns of San Luis, Maria Aurora, and many more. This part will walk you through the some of the eco-tourism destinations you should check out when in Aurora. Along the highway, soon after we had our photo ops with the Diguisit beach and Aniao islets as backdrop, our guide announced that we had just arrived at our first major destination: the multi-layered Diguisit Falls. It's nestled just a few steps from the concrete road, and people just go up there, soak in refreshing water and then go down to their private cars or rented vehicles. The rock formations at Diguisit Falls are stunning, and the crystal clear water is inviting. Hubby was able to go further up, while I just stayed midway. Make sure you have extra clothes or at least a towel to dry you up after enjoying the majestic waters. To go to Diguisit Falls, just hail a tricycle or book your resort's private tour service. Tricycle rates in Baler are not standard, so make sure to haggle, haggle, and haggle! If budget is not an issue, the convenience of having the resort arrange the tour for you is the best option. Our guide said this is just one of the beautiful falls in Aurora. Another one, the Ditumabo Falls, more popularly known as the "mother falls", is located in San Luis. This is said to be bigger, higher and more challenging as you have to trek different terrains to be able to reach the falls. I did not have the chance to visit this place but will definitely go back! 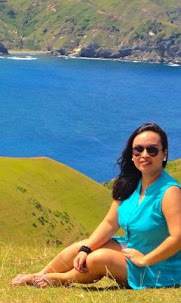 We had also visited the famous Aniao Islets and Diguisit Bay on our way to Dicasalarin Cove. The rock formations are amazingly laid as if resting on calm waters. We stopped at a spot where we could have some photo ops in between the two attractions. Roads are concrete already, but the giant rocks on the side are a bit scary. So, don't attempt to go here if there's a typhoon or if it's raining hard. It's dangerous. We continued our journey towards Dicasalarin Cove. The roads are narrow, so drivers take precaution in going up or down, beeping from time to time. On our way up, we were awestruck by the beauty of the cove! Dicasalarin Cove is private property owned by the family of former Sentaor Edgardo Angara. In fact, his rest house is nestled here. If you are a guest of Costa Pacifica Raintree, the hotel will be happy to arrange a permit for you at Php 100 per pax. Guests of the resort are the priority here. I must say, there is no other place in Baler that is synanymous to paradise than in Dicasalarin Cove. You will find out later as you read on. Our guide brought us to the Artists' Village first, a project of the Angaras. Its goal is to create a stimulating environment where artistry can flourish, not only as a hobby, but as a source of livelihood or as a calling. Our guide told us that there is a rest house built for the Ambassador of Mexico to the Philippines happens to be a very good friend of the former senator. The ambassador is reportedly supporting scholars from the University of the Philippines to study galleon papers in Mexico. At the Artists' Village, furniture pieces made of local hardwood in its purest form are displayed, as well as myriad other art installations. It was so peaceful, and all we could hear were the chirping birds. After going around the Artists' Village, we continued to explore the rest of Dicasalarin Cove, passing through a wooden bridge above a flowing river. The sound of the water was so calming. I wanted to jump into the water right there and then. From the bridge, we could see the clear water flowing on smooth rocks. When it was time to go to the beach, we couldn't help but be amazed by how stunning and well-preserved the site was. FYI, total log ban has been implemented in Aurora many years ago, so you wouldn't see a single bald mountain there. The beach is a bit pebbly but white -- ok, dirty white at that. It's a tranquil private cove that spells sun, sand, and sea. Our guide, though, warned us that the beach is not advisable for children as it is abruptly deep just a few meters from the shore. He also said that there are nice corals and fishes not too far from the beachfront. From the beach we saw the newly-built lighthouse by the famous architect Ed Calma. We asked our guide if we could go up there and he was happy to oblige. On our way to the lighthouse, we passed by another minuscule body of water with beautiful rocks on it. We even had a nice photo op there, doing some camera tricks for fun. The stairway to the lighthouse has about 170 steps, so better to do this either early morning or late afternoon when the sun is not at its hottest. Make sure to bring water, towel and fan when going up. Abit exhausting but all worth it. The view from the stairway is breathtaking. Incomparable. It's one of a kind. I hope by now you understand why I said you shouldn't miss Dicasalarin Cove when in Baler. As in never ever leave Baler without going here. The panoramic view from the top is divine. We could also see the PAGASA station from where we stood. After camwhoring at the lighthouse, we started our descent as it was getting dark already. On our way back, the former senator saw us and invited us for coffee (and snacks -- suman de Baler). In fairness, the former senator was gracious enough. Thanks Sen. Angara! The place is beautiful and we truly enjoyed our tour of your private haven! We went back to the resort after having coffee at Sen. Angara's rest house. It was already dark when we arrived. Nothing beats the facilities and food at the newly-opened Costa Pacifica Raintree in Sabang, Beach. that artist's village is wow! hi! i'm not sure if it's open as early as 5am because it is a private property of Sen. Angara. also, you cannot go there alone without a guide and a permit. You can secure a permit at Costa Pacifica., no need for 4x4, a van will do. what is the contact number in artist's village? I don't think they have a phone at the artists' village cause it's tucked in the private cove, but you may inquire at Costa Pacifica Raintree. They have a website. Hi. Does the resort provide transpo to Dicasalarin Cove? If not, would you know how we can get there and how much if we don't have our own vehicle? Thanks!